Short on time? Follow this link to a Google Maps version of our Vienna guide with all of our favorite spots labeled! You can “follow” the guide, and the saved locations will automatically transfer to your own Google Maps account. Vienna was a dream and the perfect start to our roadtrip through Central Europe. This gorgeous city is filled with Imperial history and stunning baroque architecture and treads the line between its rich past and an international, modern culture. Our 2 days in Vienna was way too short, but we were able to see a lot of the main sites. The Ringstrasse is a circular road that encompasses many of the historic and beloved landmarks. We recommend finding lodging somewhere close to the Ringstrasse so you can have easy access to the city center. Riding the tram that runs along the Ringstrasse is a great way to see the city if you run into bad weather or have blisters. There are a few options to get from the airport to the city center, but the quickest is the City Airport Train (takes 16 minutes and costs €11). 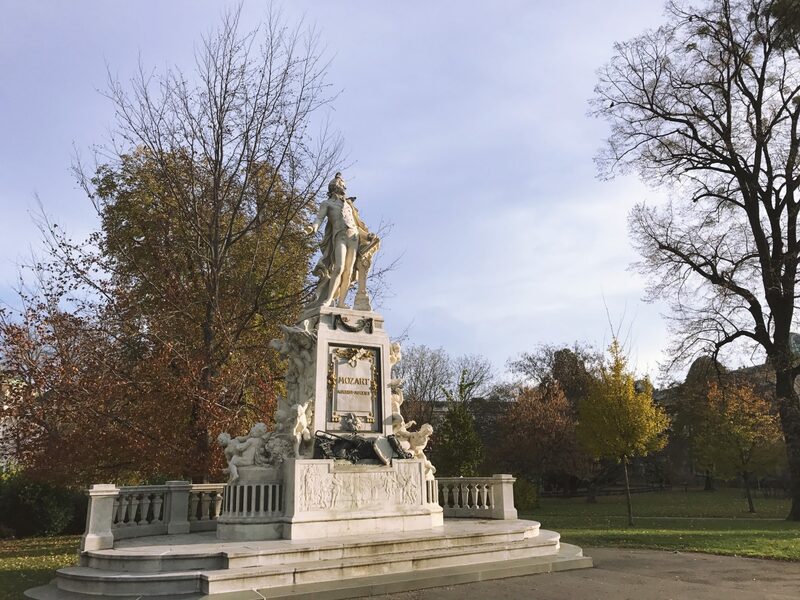 Bundle up and take a self-guided walking tour along the Ringstrasse. Because our first morning in Vienna was a Sunday and the jet lag woke us up pretty early, we were able to get a lot of the city center to ourselves. We mapped out a little walking tour on Google Maps. You can do this in any order depending on where you are located, but we walked through Burggarten (a beautiful garden with a huge statue of Mozart), passed by the Staatsoper (opera house), the Stephansdom (stunning cathedral built in 12th century), Peterskirche (a smaller but much older Catholic Church), the Hofburg Palace (home base of the Habsburgs empire), and the MuseumsQuartier. The tour took a couple of hours and gave us a great overview of the city’s cultural center. Embrace the coffee shop culture at Cafe Central. When in Vienna, do as the Viennese do – grab a coffee and relax in an elegant booth at Cafe Central. Tourists crowd the tables in this historic cafe, hoping to rub shoulders with the ghosts of Freud and Trotsky, two of many notable patrons of the past. To beat the rush, we recommend arriving a few minutes before the doors open. Despite the crowds, the service was perfect, and the almond croissant was the best thing I ate in Austria. I also strongly suggest the sacher torte, a classic Austrian chocolate cake. Get artsy at the Albertina. Even for less-than-sophisticated art connoisseurs like ourselves, the Albertina was amazing. If you’re a one-museum-per-city type of person, this is the one to hit during your stay in Vienna. With works by Renoir, Monet, Degas, and Raphael, it was one of our favorite museums we’ve ever visited. Tour the Opera House (or see a show!). Unfortunately, an ill-timed power nap made us miss the tour of the Opera House that we had planned on joining. If we had more time in Vienna, we could have purchased a €3-4 standing room only ticket to a show that night. The Opera House is one of the most beautiful sites Vienna has to offer, and we were really bummed that we missed the inside of it this time around. Take a gander, and tell us how it is. Dine at a 300 year old restaurant. You know you are in for a great night when the restaurant you’re walking into has been in business longer than the USA. Opened in 1683, Esterhazykeller is a traditional Viennese restaurant located in an underground cellar. They have live music on the weekends (to be specific, a violinist and accordion player who stop at every table for entire songs at a time), and the atmosphere is phenomenal. The menu is reasonably priced and full of Viennese classics – wiener schnitzel, goulash, and schweinsbraten. Definitely, definitely recommend kicking off your stay in Vienna with a meal here. Stroll through the Christmas market at the Schonbrunn Palace. Ice skate under the trees at the Rathausplatz. After filling up on mulled wine and bratwurst, we made our way back to the city center to check out the impeccably decorated market at the Rathausplatz. We paid €7 each to skate under the lights of the city hall, on a rink built around the trees in the square. SO WORTH IT. There isn’t a better way to kick off the holiday season than gliding around the Disneyland of ice skating to the tune of Austrian children singing Christmas carols. If you found our Vienna guide helpful, relevant, or entertaining, we’d absolutely love it if you chose to follow along on Instagram.